Stir a roughly chopped bunch of fresh coriander into a small pot Waitrose Natural Wholemilk Bio Yogurt then sprinkle with a few crushed cardamom pods. Stir into a 600g tub warm Waitrose Pilau Rice. 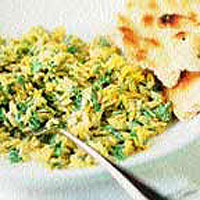 Serve with naan bread.